Athletic trainers must have a foundation in the concepts of evidence-based practice to deliver patient care in an effective way. It is critical that students and clinicians formulate clinical plans that will be effective for individual patients. With that goal in mind, Evidence-Guided Practice: A Framework for Clinical Decision Making in Athletic Training teaches the athletic trainer that evidence-based practice concepts must be incorporated into daily clinical practice. Written in a conversational tone, Drs. Bonnie Van Lunen, Dorice Hankemeier, and Cailee Welch provide a practical and concise resource for athletic trainers to use when interpreting what the available evidence means for them and how it can be effectively applied in daily patient care. The competencies within athletic training and other health care professions were considered when each chapter was constructed. Special care was taken to include examples that are specific to athletic training and instructional applications for educators. 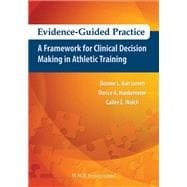 The first of its kind, Evidence-Guided Practice: A Framework for Clinical Decision Making in Athletic Training is the only resource athletic training students, clinicians, or other health care professionals will need to properly put evidence-based concepts into practice. Bonnie L. Van Lunen, PhD, ATC, FNATA serves as the Director of the Commission on Accreditation of Athletic Training Education Accredited Post-Professional Athletic Training Program and is the Chair of the School of Physical Therapy and Athletic Training at Old Dominion University (Norfolk, Virginia). She received her bachelor of science degree in physical education with a specialization in athletic training from Castleton State College (Castleton, Vermont) in 1990 and her master of education degree in athletic training from the University of Virginia (Charlottesville, Virginia) in 1991. In addition, she received her doctor of philosophy degree in sports medicine from the University of Virginia in 1998. Her primary area of research interest is in outcomes related to competency development and implementation. Dr. Van Lunen has served in various capacities on committees for the National Athletic Trainers’ Association (NATA) and the Commission on Accreditation of Athletic Training Education throughout her career. She serves on numerous editorial boards, publishes frequently in athletic training and sports medicine journals, and is a NATA Fellow. She was awarded the NATA Distinguished Educator Award in 2014 and the NATA Service Award in 2012. She resides in the Outer Banks of North Carolina with her husband, John, daughter, Alivian, and sons, Brady and Cameron. Dorice A. Hankemeier, PhD, ATC is an Assistant Professor of Athletic Training in the School of Physical Education and Exercise Science at Ball State University (Muncie, Indiana). Dr. Hankemeier earned her bachelor of arts degree in exercise science with a concentration in athletic training from Central College (Pella, Iowa), and her master of science degree in education with an emphasis in athletic training from Old Dominion University (Norfolk, Virginia). After obtaining her degree, she served as an Athletic Trainer and Clinical Education Coordinator at Anderson University (Anderson, Indiana). Dr. Hankemeier then returned to Old Dominion University to obtain her doctorate in human movement science with an emphasis in athletic training curriculum and instruction. Her research focused on the implementation of evidence-based practice in the clinical education setting. Currently, Dr. Hankemeier serves as the Clinical Education Coordinator at Ball State University. She serves as a Site Visitor for the Commission on Accreditation of Athletic Training Education, is a manuscript reviewer for several journals, and is a member of the Great Lakes Athletic Trainers Association Education Committee. She was awarded the National Athletic Trainers’ Association Research & Educational Foundation Doctoral Dissertation Award in 2013. Dr. Hankemeier’s research interests focus on promoting evidence-based practice in athletic training and investigating educational outcomes of athletic training programs. Cailee E. Welch, PhD, ATC is an Assistant Professor of Athletic Training within the Department of Interdisciplinary Health Sciences at A.T. Still University (Mesa, Arizona). Dr. Welch earned her bachelor of science degree in Athletic Training from Boston University (Boston, Massachusetts), followed by a master of science in education degree in athletic training from Old Dominion University (Norfolk, Virginia). She also earned her doctorate in human movement science with a special focus in athletic training curriculum and instruction from Old Dominion University, where she investigated the effectiveness of educational techniques to aid athletic trainers in learning the fundamentals of evidence-based practice. While at Old Dominion University, Dr. Welch served as an instructor for several undergraduate courses within the Health and Physical Education and Exercise Science Departments and was a teaching fellow for numerous courses with the Post-Professional Athletic Training Program. Recently, Dr. Welch completed a postdoctoral research fellowship in the Center for Clinical Outcome Studies at A.T. Still University. As a part of her postdoctoral fellowship, Dr. Welch assisted with clinical outcomes and evidence-based practice courses within the Post-Professional Athletic Training Program. Currently, she serves as the Clinical Practice Site Coordinator within the Athletic Training Practice-Based Research Network, which includes conducting the education and training for athletic trainers across the country. Additionally, Dr. Welch currently serves on the Commission on Accreditation of Athletic Training Education Post-Professional Annual Report Committee and the Board of Certification Evidence-Based Practice Review Panel and is the Managing Editor for the Clinical Bottom Line in the National Athletic Trainers’ Association News. Dr. Welch’s research agenda focuses on health care professional education and practice interventions to enhance clinical practice behaviors. Specifically, she is interested in assessing athletic training educational outcomes and identifying interventions to promote concussion education and enhance concussion management practices.